Earlier today, while announcing the Droid Turbo 2, Motorola said that one of the problems with today's smartphones was that they're "too fragile". Naturally, this is why Motorola developed the 5.4-inch Quad HD ShatterShield display for the new Turbo. According to the company, this is a shatterproof screen that will give users piece of mind for no less than 4 years, during which "the display and embedded lens are covered against shattering and cracking." To illustrate how tough the Droid Turbo 2 is compared to other handsets, Motorola has an official ad prominently featuring iPhones (among other devices) that are dropped onto concrete and easily get shattered. You can watch the ad below. Keep in mind the fact that, although Motorola's ShatterShield display may not crack, you'll still have to be careful with the Droid Turbo 2, because, as Motorola is mentioning, the phone itself "is not shockproof, and can still be damaged if you drop it." The Droid Turbo 2 will be available to buy in the US later this week, on October 29, exclusively at Verizon Wireless. The handset will be sold for prices starting at $624 off contract, or $26 per month. Are you planning to get one? Moto has a point.... Finally Really needed innovation came .. They are, but they're doing it wrong. They should follow Apple's model for making money with screen tech. 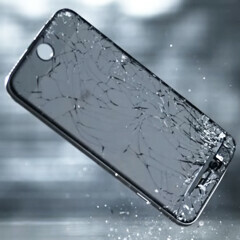 Make it more brittle with something easily marketable like Sapphire glass and then start a repair service that charges a premium to even AppleCare owners (albiet less than the non AppleCare owners). Yes, and not allow oem replacement screens to be sold to the public so they have to rely on cheap, chinese products or go to the 'ripoff bar'. The original comment changed. Reason why other companies have not looked into shatterproof glass is because you have to pay to replace it or buy a new phone. Who is giving for free? 2016.. Will be a year of great progress in smartphones.. Enter -Shatterproof era -ultrasonic fingerprint scanner -iris scanner -4k display -Horsepower socs -wireless charging -Great Camera optics These are the new standards.. Which make me look forward for 2016 devices... There will be a "hotbed" of competition..
Nokia had shatter proof LCD screen? Yea I had dumb Nokia phone circa 2003 with tiny LCD screen which was pretty much shatter proof. But is there a large screen modern smart phone from Nokia which is really shatter proof like Moto Droid Turbo 2? Yup, Lumia 920, my little sister used to play marbles with it. That's what got me into nokia honestly. Agreed. No one with a brain buys FRAGILE iphones or 2015 Samsungs. Try washing your hands first after you've waxed the dolphin instead of using your smartphone right away. Why did they drop it facing that side instead of the front? because dropping on the side is actually the most likely way it will be cracked. If moto's numbers increase significantly YOY then you can bet the competition will change to a tougher display. Hell, LG and Samsung have both already said they will have bendable or foldable displays in 2016.
couldn't have picked a better example, I've only seen 3 iPhone 6's in the wild and 2 of them had broken screens. which is really sad for a premium handset. Swarovski crystal and Fabergé eggs are premium, too. You definitely don't want to drop those. Not the brightest bulb in the box are you? Aw I feel super flattered that in one year you have only 23 posts and I happen to be one of those! Lovington this second account you have here! Now, now. My point is that you can be careless with your *cough* $800 investment, or you can take steps (like a protective case) to keep it safe. They're not toys, folks, we just treat 'em that way. It is pretty silly to care about the pretty color of your iPhone or Galaxy when you're going to end up with using a case though. Yes I personally saw an iphone 6 screen shatter - one of my friend dropped it while sitting at a table, probably no more than 3 foot drop. It didn't have a protective case and screen shattered unfortunately. Despite what Apple claim, iphone screens have not improved at all in durability since original iphone as numerous drop tests show.